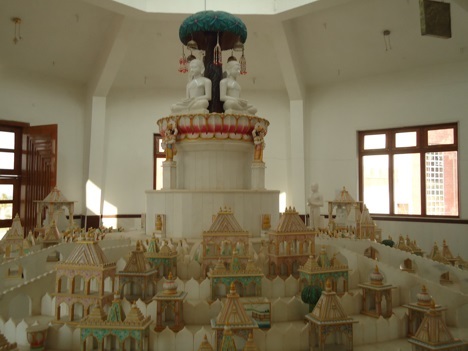 Jainism Beliefs - What do Jain believe? Jainism is traditionally known as Jaina dharma. Jainism is an ancient Indian religion, and traditionally traces its history through 24 tirthankara (propagators of the religion). The first tirthankara was Adinatha, and the last of the twenty-four was Mahavira. Jainism gets its name from the Sanskrit (an ancient Indian language) verb Ji. Ji means "to conquer", and refers to winning the battle against passions and bodily pleasures undertaken by ascetics. People who win the battle are referred to as "Jina" (conqueror), and the word "Jaina" is used to refer to those adhering to the religion. Jains emphasize the principle of pluralism and multiplicity of viewpoints. This is expressed in the doctrine of anekantavada which states truth and reality are perceived differently from many diverse points of view, and no single point of view is complete. Anekantavada encourages Jains to consider the views and beliefs of even rivals and opposing parties. Jainism emphasizes non-violence (ahimsa) to all living beings and the equality of all forms of life. Jains believe that non-violence and self-control are the path to liberation. Jains take steps to avoid injuring or killing insects or small animals, even accidentally. Thus, they avoid going out at night (to avoid trampling insects), avoid eating honey (because it involves violence against bees), and avoid farming (because it involves unintentional killing of worms and insects). Harsh words are considered a form of violence, so Jains wear a cloth or ritual mouth covering as a reminder to use violence in speech. Jains are strict vegetarians (although milk is permitted). They also avoid garlic and onions, and many Jains also avoid potatoes and all root vegetables - because tiny organisms are injured when the vegetable is pulled up, and the root/tuber's ability to sprout is indictative of a living being. Jains who have taken ascetic vows may eat a completely vegan diet (without milk), as the production of dairy products are perceived to involve violence against cows. While recognizing that all life-forms deserve protection from harm, Jains do recognize that complete protection of all life is not possible in practice - and thus do have a hierarchy, with mobile life-forms taking precedence over immobile life, and life-forms with more senses taking precedence over life-forms with fewer senses. Likewise Jains generally recognize that violence in self-defense can be justified, as violence (including killing) by soldiers performing their duties. For further information about what Jains believe, please review our recommended further reading on Jainism.